The Angel gang were too good to die and it is nice to have another helping. The previously unknown extra son doesn’t feel contrived and the flashback to his childhood allows us to see all the Angels in action as well as learn Mean Angel’s origins. Likewise it is good to see previous judges in addition to Giant once in a while. Shame Hershey still doesn’t get much to do. We see Resyk for the first time and it is a great sci-fi concept and cool backdrop for a fight scene. The art is strong with Fink Angel having a distinctive and dramatic look. Some of the strip’s pages were in colour and unfortunately don’t come out very well when reprinted in black and white. 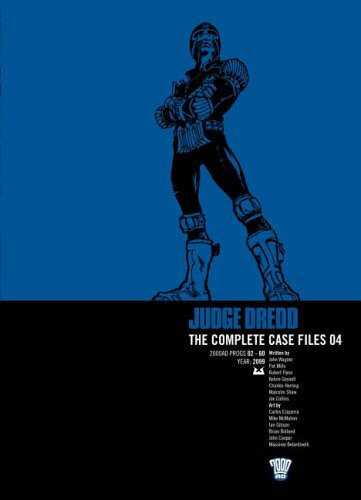 We are very far from the early days of Dredd and its crazy layouts. Straight edges are king and the only regular bleeds are the sound effects and speech bubbles. There is one incredible panel where the smoke from a chimney below rises to the frame above and cracks Fink’s face in two just as he is remembering his childhood. Genius! Adverts projected on the moon. Now that is proper Sci-Fi stuff. A moment of brilliance in an otherwise uneventful story. Yet another Robonapping story featuring Walter. It does have a very clever moment though. And Real Synthetic Indian Curry from a curry tablet. An interesting idea that is wasted in such a brief story. The Maze however is such a great idea. So nice to see Otto Sump once more and in an intelligent story about vanity and the fads of modern society. The art is great at depicting all the horrid ugliness too. Stars of the show are the fake adverts for all the ugly products that were inspired by real commercials of the day.